While the specific impacts of Corel’s new leadership on the evolution of MindManager since it purchased the program in August 2016 are hard for an outsider to quantify, they seem to have been considerable. The process of change started with MM2017, which I described at the time as delivering “a number of unexpected but mostly pleasant surprises”. These included HTML5 export, Zapier integration, horizontal and vertical timelines, Gantt critical path and simplified file management. It could have been argued at the time that many of these features were probably in the pipeline when Corel took over, but this was a harder claim to make in relation to the subsequent release of MM2017.1. Even though this was “just” a point release it contained so many new features that Corel could almost have justified calling it a full upgrade, especially on the strength of one addition alone: Map Roll-up. This allows users to create a single map which can pull together and summarise selected data from a range of other maps and, most significant of all, keep this rolled-up information up-to-date. It is such a great feature I was intrigued as to why it was released not only with little fanfare but also (initially at least) no instructions even in the MM2017.1 help file. I wrote a post specifically on how to use it and also outlined an (even more) undocumented feature, in-map dashboards – the ability to create a dashboard of a map within the same map. I thought this was incredibly useful and was therefore very disappointed when changes in the MM 2017.2 upgrade had the side effect of killing off in-map dashboards, to the extent that the maps I had created with this feature in 2017.1 all crashed comprehensively when opened in 2017.2. I thought that Corel was reverting to the bad old days of developing (or buying in) new features for MindManager and then subsequently removing key aspects of these features in later releases (more on that in a moment). It turns out that my fears were unfounded. Corel has recently released MM2018 with an impressive range of new features. This is the first release of MM which clearly indicates the direction the new owners want to take with the program, given they took it over 14 months ago. The introduction of a number of graphic elements such as shapes and dividers and interactive presentation export reflect Corel’s design heritage and hint at things to come. Just as important as the addition of these features is an impression that Corel really want to get even the small things right. This includes fixing and improving some existing features and even breathing life into older ones that had been previously left to languish. As part of this process I am very pleased to say that in-map dashboards have been fully restored. I’m taking a look at some of the changes in MM2018 over the next few weeks. In this article I’ll take a look at the changes to Map Roll-ups, but I’ll start with a feature that really has come back from the dead – Conditional Formatting. I have always criticised Mindjet’s tendency to buy some of the better third-party add-ins and in the process of integrating them into MindManager substantially dumb them down. The most egregious example of this was the handling of one of the greatest MM add-ins of all time – Nick Duffill’s Power Markers, which provided extensive and flexible user-customisable conditional formatting. There was one problem with Power Markers – its interface was complex and required a bit of a learning curve. This was the excuse that Mindjet used when they acquired Power Markers to dump the conditional formatting feature, retaining only the add-in’s Marker Index facility – which later became the Map Index. A much-simplified version of conditional formatting, Smart Fill, was subsequently incorporated into MM but this was just a faint echo of the original add-in. Everything has changed with the release of MM2018. Conditional Formatting makes a triumphant comeback with many of the features of its predecessor but sporting an easy-to-use interface which make it very customisable. A series of dialogue boxes guides the user through the process. You select a trigger which can be just about any aspect of a task but also things like the number of attachments, links or subtitles and even attributes like icons, properties, resources and tags – not to mention text in topic names. You can also set a wide range of conditions, i.e., “Contains or “Does Not Contain”, for example, or “Is Greater Than or Equal To” or “Is Before”, etc, depending on the nature of the trigger attribute. The choice of formatting is also very broad – either topic-related such as shape, fill colour and line colour, or font-related. The font effects include font size, italic, underline, strikethrough and colour though, surprisingly, not bold. Multiple triggers and multiple effects can also be added and once the rule is set up it can be saved to a library from which it can be added to other maps. Essentially, Conditional Formatting gives users another way to view the information in their maps. 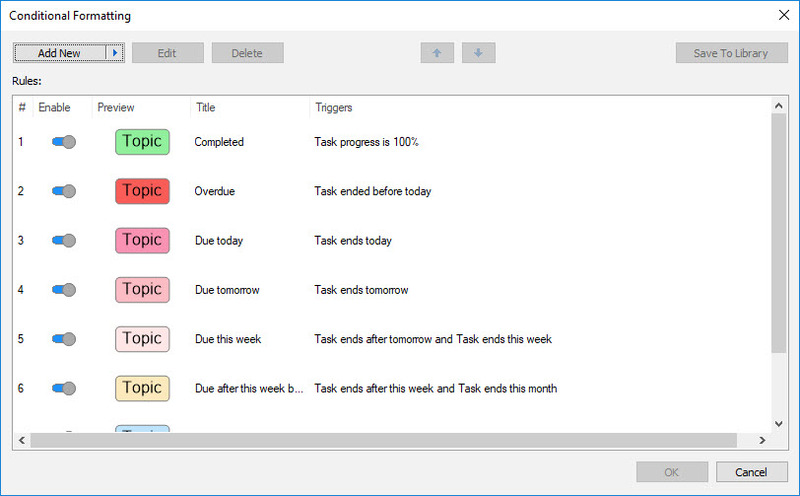 For example, you can see easily which tasks are due next week – or the week after that – without having to filter the map. You can also set up rules to highlight topics containing specific company names, or tags representing certain products, and even combine the two. Conditional formatting can also be switched off to reveal the topic’s original appearance, but only topic-by-topic (multiple topics can be selected to do this, however). So, it’s a big thank-you to Corel for restoring Conditional Formatting. I think this is a great tool which has enormous potential, especially when combined with Map Roll-ups (see below). It seems to have been well implemented and at this stage I can think of only two improvements – the addition of bold type to the list of topic effects, and a “global” map-wide switch to turn conditional formatting on or off. Having been introduced in MM2017.1, Map Roll-ups isn’t a particularly new feature and it hasn’t been substantially upgraded in MM2018, but as you can gather I’m very pleased that Corel has come to the party and restored the in-map dashboard facility. As I noted previously I wrote instructions on the-then undocumented Map Roll-ups in a post earlier this year. To recap, using any topic in a map you can display a “rolled-up” single topic or a whole branch from another map; the link established in this way is live and any changes made in the source map will be visible in the map with the roll-up when it is refreshed. The ability to do this from a floating topic within the same map was also undocumented and, I suspect, unintended. Why is this feature so significant? Like conditional formatting, in-map dashboards provide users with a fresh way in which to look at their data. The benefits of being able to pull together information from across a number of maps into a single dashboard are fairly obvious, but an in-map dashboard provides a great way to summarise material within a map, especially if it is very large or complex. The advantage of this over, say, map filtering or conditional formatting is that you have complete freedom to choose whichever topics you want to track, and you can do so without changing the appearance of the main map. Corel have also cleaned up a couple of bugs that came with the original Map-Roll-up feature. The first (fixed I think in 2017.2) is that adding a Map Roll-up no longer converts the existing topic to be the rolled-up topic; now it behaves “normally” by attaching the rolled-up topic. The second bug fix is more of a work in progress. Previously, if you filtered a dashboard map, saved it and then reopened it, strange things occurred; the filter indicator would appear, but the map would not actually be filtered. Now in MM2018 the map opens as it was saved, but it still won’t pick up any changes that were made in the source map after the dashboard map was saved. To show these changes you effectively have to delete and reapply the filter. A third bug has gone unfixed – for some reason in-map dashboards are still not documented in the help file or elsewhere. These quibbles aside, Corel deserves praise again for the restoration of in-map dashboards to the Map Roll-up feature. I’m just starting to explore how you can combine these and the other new features of MM2018. For example, Conditional Formatting can be applied to either a separate dashboard map, or if you establish an in-map dashboard for a large map you can then set up conditional formatting rules selectively within the same map. You could turn off these rules for all topics in the main map but retain them for the dashboard, thus showing the original topic appearance in the main map while the dashboard conveys critical information such as overdue tasks. I’ll explore this relationship further in a future post but in the next in this series I’ll look at some of the other features that Corel has added – or transformed – in MM2018. 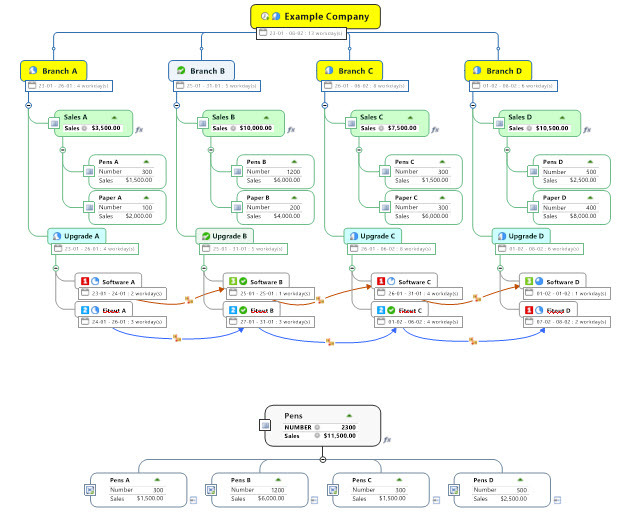 This entry was posted in Mind Mapping, New Version Overviews, Viewing, Filtering and Formatting and tagged Mind Mapping, MindManager. Bookmark the permalink. Prior to my retiring, I used MindManager for Windows for many years through many versions. A common complaint that I would see was that the Macintosh version was woefully weak compared to the Windows versions. Is this trend going to continue? I would love to have a Macintosh version with the features you describe here. Thanks for your comment. I don’t use the Mac version but it seems to have fallen far behind MindManager for Windows. I hope that the new owners Corel can reverse this trend and also while they’re at it substantially boost the iOS version.